We just got back from the 2016 Hummer-Bird Festival that was held in Rockport, Texas. Like always, we had a wonderful show. Lots and lots of folks soaking up fantastic information about all kinds of birds! We went to a Raptor show and saw a falcon, a kookaburra, a barn owl and an awesome vulture named Ziggy. Tons of fun. While we were there, people would come into our booth and tell us that they saw our pots at Mrs. Harvette Green's house. She was on the Hummer House Tour (you can tour a group of houses that have many, many hummingbirds zooming around and sit and watch the hummers). They told us how she was hanging her hummingbird feeders from our pots. What a wonderful idea! Isn't it awesome? 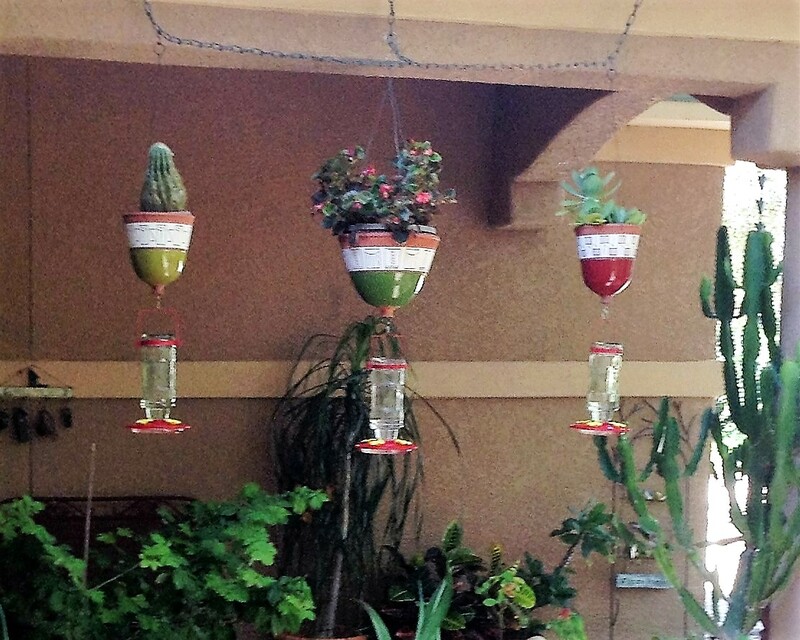 We love it too and can not thank her enough for expanding the use of the hanging flower pots. She told us how she did it and now we will have this option available in the booth. Way cool!!! Green Dog Studio at the Texas Clay Festival. Each pot is wheel thrown, hand carved and brightly glazed.